Alas, it was a successful outing in most respects but for me. My paper was built on insight and enthusiasm rather than strong evidence and tight argument: high on sugar and low on protein. I remember Shawn McHale asking during the round of questions, “Where is nationalism? I don’t see nationalism at all.” It was a very good question, and I am afraid I didn’t offer a good response at all. I spoke with Shawn after the panel–it was our first meeting–and he kindly nodded his head while listening to further unconvincing justification from the misguided graduate student. Although a few bits from the paper went into my dissertation later, it was mercifully put away after the AAS. In fact, I could not find it when a budding researcher emailed to ask for a copy a few months ago. It is probably in an aged laptop somewhere in the house: not an improper burial lot for half-baked and unseasoned conference papers. One problem was the lack of a sharp argument. Another was evidence. Mind you, at least a few pieces of evidence were nice enough. But they were not top-notched. They were passable microbrew but not single malt Scotch, and to this party you should bring Scotch, especially if you were lower on the totem pole as a graduate student. There is bound to be skepticism from others, and not without good reason. I didn’t have Scotch or even bourbon for this one. Yet my foolish endeavor somehow worked out in the end, thanks to (modesty aside) my scrappiness and especially the generosity of others. David Hunt emailed me afterwards and said that I should get in touch with Jason Gibbs whose paper he had heard at another conference. David Biggs, whom I also met for the first time, suggested comparing Saigon music to NLF music. It was out of this encounter that I later asked him to be my predoc mentor, a decision that changed my life in several unexpected ways. And Shawn McHale has been helpful in several ways since. Funny, but I rather liked his “brief and blunt” style of questioning, especially because conference Q&As could sometimes turn into a stage for academic one-upmanship. Along with my advisor and several faculty at Notre Dame–Tom Kselman comes especially to mind–people like Shawn and the two Davids helped to show a model of collegiality and generosity, including at conferences, to which I am committed as long as I am in academia. But back to that paper, one example I gave was a little-known song from South Vietnam by the name Tuổi Trẻ Chúng Tôi, whose literal if inelegant translation is Our Youth. Were it the title of a Vietnamese movie imported to the U.S., it’s almost certain that the American distributor will insist on a different name. I’ll call it This Is Our Youth. The song wasn’t a bad example, but I did a poor job analyzing it. The aforementioned email made me revisit this song recently and it prompted the following thoughts. 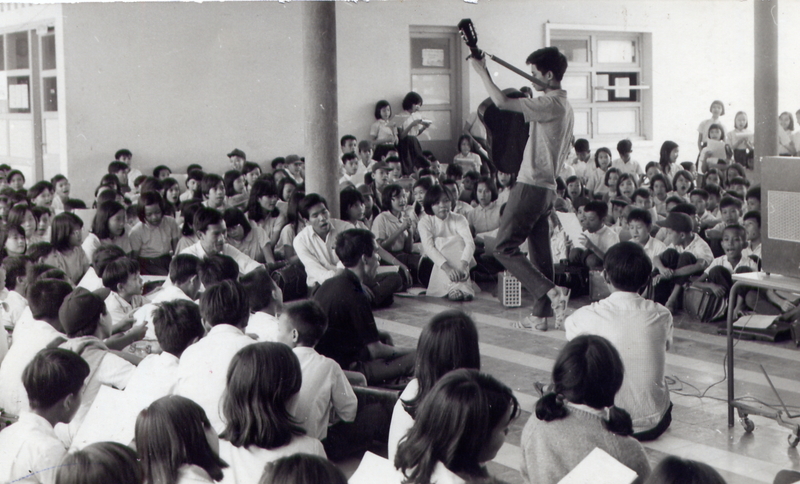 Tuổi Trẻ Chúng Tôi was released in 1972 as part of the first and only tape released by the Du Ca, a government-recognized musical movement of noncommunist young adults during the late 1960s and early 1970s. There were over thirty Du Ca groups in towns and cities throughout South Vietnam. The movement’s best known musician was Nguyễn Đức Quang, whose song Việt Nam Quê Hương Ngạo Nghễ—Vietnam, Proud Country–was very popular among Vietnamese that it could have been a candidate for the national anthem of the Republic of Vietnam had it appeared in the 1950s. I remember quoting this song in the paper but, again, did not develop it. The author of This Is Our Youth, and singer in the recording, was Giang Châu, one of the lesser-known songwriters of Du Ca. Little is known about his life, not even his actual birth year. He participated in the Du Ca group in my hometown Biên Hòa and worked as a technician of some sorts at the airbase. One reason for his obscurity has to do with his death from excessive fasting and yoga (?) in the same year of the tape’s release, probably in his early thirties. His only released recordings came from this tape: This Is Our Youth on Side A and a second song on Side B. As you could hear, the voice is hurried and the pace relentless. For instance, the clarinet sometimes sounds as if it were catching up with the vocal instead of traveling along with it. Commenced by a marching beat led by piano, acoustic guitar, and some nifty snare-drumming, Giang Châu bursts open at 0:11 and sings as if he had been bottled up inside for years. His tone is a mixture of anger, sorrow, and frustration. The lyrics could be viewed as a series of grievances and declarations, and he moves through them as if there were little time left to declare. Note, for example, slight muscle strains such as at 0:36, 2:10, and 2:26. After the instrumental break, his voice picks up and repeats in entirety and the same manner. It might not be pretty, but it is apt and effective, all the more poignant because of Giang Châu’s death not long after the recording. In my listening, the song demonstrates the exasperation among urban youths and other Vietnamese over the ongoing war and American takeover in the latter half of the 1960s. Americanization ensured survival of Republican Saigon against the communists. But the U.S. military could not end to the war, and its growing presence led to confusion, frustration, and anger among noncommunist South Vietnamese over the future of their country. The Paris Peace Accords were not yet signed at this point, and the wave of songs looking towards peace was still about a year away to hit to airwaves and cassette players. The time was very emotional, and the lyrics and rhythm reflect the mood. They continue to impress even in a very different setting, in this case the 50th anniversary of the Du Ca movement in Northern California earlier this year. Let me walk quickly through the lyrics. (My translation aims to capture emotion at expense of nuances from details and symbols.) The first verse is lamentation, but it is not weak-kneed lamentation and, instead, blunt and forceful. It describes the current situation of Vietnamese youth in quick strokes, and sharpens the description with the question For what? in the middle. Này vì đâu, này vì đâu? Kiếp sống nào như loài cỏ cây. For too long our youth has gone to the burning stake. For too long it has turned rootless like night clouds. Where hatred thrives and human lives mean little. The second verse continues the fuming grievance by bolstering the visual image of fire and burning. It duplicates the line structure of the first verse, including the repetition on lines five and six: the question Này vì đâu, này vì đâu, and ngất núi ngất núi in the first verse and now kiếp sống kiếp sống in the second. It also buttresses the verbal rhythm of lần lượt and lang thang in the first verse with héo hắt, mê man, nhục nhằn. Héo hắt đi trong cơn ưu phiền. Nước mắt nào dâng nghẹn đầy vơi. For too long our youth has sunk into dark sorrow. For too long it has withered in deep grief. Weeping to the point of exhaustion. Bao nghìn năm anh dũng? The image of forced silence in the first question is reinforced by the image of head-bowing in humiliation in the second half of the chorus. Cho danh từ rỗng không? Making sacrifices for ideology and empty slogans? Although “foreigners” are mentioned only once in the song, their appearance at the climax is telling and significant. Up to this point, the target of protest and grievances is implied at best. It is clearer here. Thoát xích xiềng gông cùm nhục ô.
We’ve listened to our hearts, and heard the call from our ancestors. We’ve heard from out hearts boiling calls for a time of change. Create a new life, new life. Out of degrading shackles and chains. Although it echoed contemporary mood, This Is Our Youth was out of the mainstream and never remotely reached the popularity of some other Du Ca songs. To my knowledge, it has never been re-recorded or performed in one of the popular video series in the diaspora. Most likely, it has been sung only at Du Ca gatherings such as the above. In recent years, however, it has found a small second life thanks to (a) YouTube and (b) Sino-Vietnamese tension over issues such as bauxite mining and especially nautical disputes about the Paracels and Spratlys. At least a couple of videos juxtapose Giang Châu’s recording with visual images of flag-waving protests against China, presumably to the question “why making sacrifices for foreigners?” Or, it has been directed against the Vietnamese government: perhaps “sacrifices for ideology and empty slogans?” Or, more likely, against perceived ineffectual governmental dealings in confronting China’s behavior. It has also been sung among new Du Ca groups in Vietnam. The videos are suggestive of its potency in articulating a common experience when Vietnamese felt threatened by real or perceived takeover of their country by foreigners: be they China, the U.S., the Cold War, or something else. It is enduring if in a small way. I also think This Is Our Youth is better classified as a song of protest than a “nationalist” song. To be sure, there is some overlap between them, including the reference to “heroic millennium” and invocation of anti-foreign tradition among Vietnamese. In addition, the tone and emotion behind was fueled by an intimate identification to the Vietnamese nation. It’s tricky explaining emotion, though, because it could be attributed to a number of sources. This Is Our Youth was an outburst against the diminishing of Vietnamese youths on the one hand and diminished sovereignty on the one hand. As a composition, however, it is too pointed, too single-minded, and, oddly, too energetic to articulate something broader than protest. Of course, no single song could articulate an ideology, not even Nguyễn Đức Quang’s famous song. A convincing analysis will necessarily include a lot of examples. In any event, I think there are more nuanced examples than Tuổi Trẻ Chúng Tôi. They include another little-performed South Vietnamese song that suggests a moderate and even conservative variety of nationalism in comparison to the more radical sort advocated by Vietnamese communism. I will write about it in the next post. I have not been able to figure out what I think of Du Ca. I should get to know the genre better. It strikes me as being political and as being anti-war, yet if their compatriots stopped fighting it only invited the communists for whom they had no love for either. As you noted the enduring enemy is always foreigners (the U.S., China, take your pick). The other enemy here is ideology (which I’m guessing is an indirect reference to communism). The song expresses a general rage against the horrible situation he and his generation found themselves in. But it seems to come from an underlying powerlessness. Did they have a persuasive alternative political vision to unite behind? I don’t care much for the arrangement – a jaunty martial beat. A march is supposed to gather everyone together to step forward as one to some goal. But I don’t detect a goal. The sentiment of the lyrics would be suited to a hard rock song, to an actual music of rage. But it would also make sense accompanied by a guitarist slashing hard at his acoustic guitar. “Powerlessness” is perfect description. Yes, it’s kind of hard to pinpoint Du Ca’s program and nature without documentation from the time. There might have been some loose affiliation to the Boys Scouts – NĐQ had been one – and other youth and student organizations. Perhaps it was a social movement as much as a political one? Hard to say without further documents. Cool, Tuan!!! Looking forward to catching up this summer!!! !